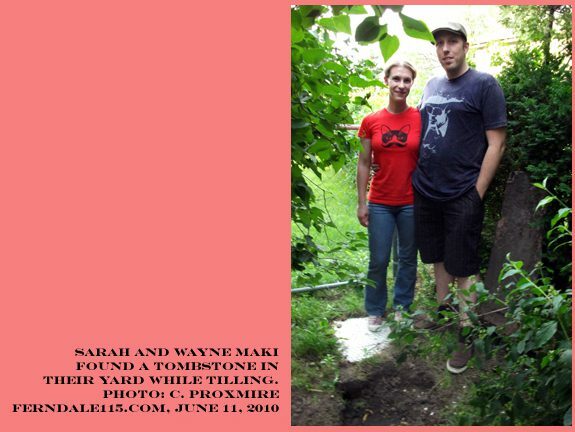 When Wayne and Sarah Maki purchased their house at 1527 Pearson they had no idea that their 1929-built home came with a 200-year-old mystery buried in the back yard. “We were roto-tilling our backyard to lay down new grass seed, and it was near the end of our tilling,” said Wayne. “There was a ton of broken concrete underground in our yard, so I didn’t think much of it when the tiller hit.” But instead of another concrete chunk, the 31-year-old photographer happened upon what appears to be an 18th century tombstone that had been lying face down beneath just a couple inches of dirt. The couple was shocked as they unearthed the poured concrete slab with words that were most-likely etched in as the concrete was setting up, sometime in the 1700s. 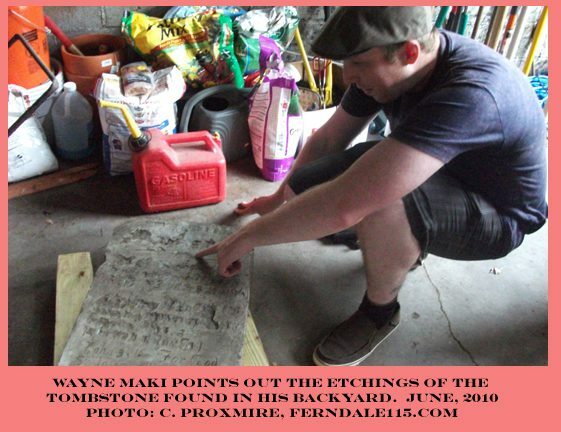 After consulting with a scientist at The Cranbrook Institute and Ferndale Historical Museum Director Garry Andrews, they have been able to make out some of the words on the tombstone and have some guesses as to what might be the story behind it. There is also an indistinguishable line of markings that were probably text along the bottom left of the stone. In addition to the tombstone there were two long slabs of concrete below the surface of the ground directly in front of the tombstone – laid out lengthwise next to each other in a way that would suggest they might be protecting a body. 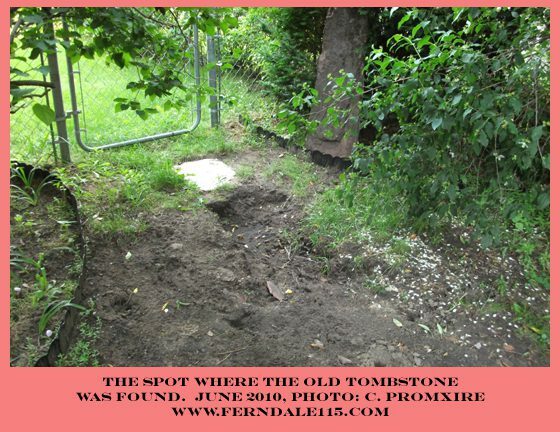 Sometimes tombstones get moved for various reasons, such as theft or vandalism, so there is no guarantee that there is an actual grave in the back yard. However the fact that the stone was lying face down and there were concrete slabs in front of it makes it more likely to be a legitimate burial site. The Maki’s don’t intend to find out for certain. 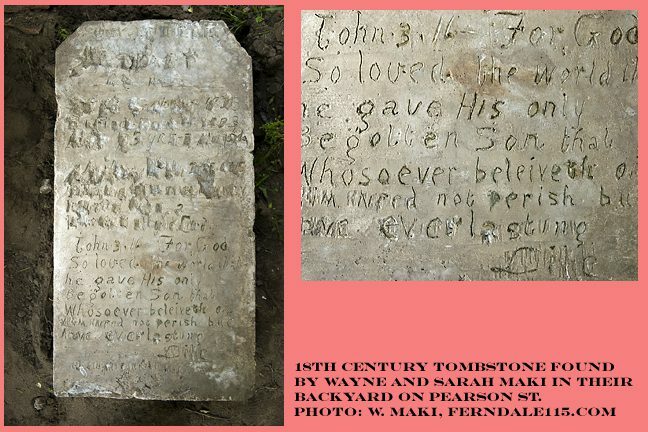 The tombstone is currently being stored until a tombstone expert from the County can examine it, and the couple can decide how they want to best preserve the 200 year old marker, which is theirs to keep unless it is ever taken away for evidence.